Please enjoy this guest post from Delyse foods! “Halloween is one of our very favorite times of year! We can start putting pumpkin in our coffee (pumpkin spice latte anyone?) and stock up on apples for those delicious fall baked goods — pick them yourself at one of these farms. We also love making pumpkin pie and carving pumpkins for our parties and porches. October is fun for the whole family! It’s also a time for costumes, parties and trick-or-treating. And that makes it a great time to think about all the candy being given out, exchanged and consumed. Most mass-manufactured candy has a lot of calories, processed ingredients and even toxins. Did know you many popular candies contain cleaning agents and environmental pollutants? Those are certainly things you don’t want to put in your body! For a healthier option, try almond pralines. Traditional French pralines consist of just 2 simple ingredients: heart-healthy almonds covered in caramelized sugar (cooked or browned sugar). Kids will love the sweetness, and you’ll love the natural ingredients! Another great option is milk chocolate-covered almond pralines (also in trick-or-treat size). We take the original French almond praline and cover it with pure milk chocolate. This is a great candy to hand out instead of high-calorie chocolate and candy bars. These milk chocolate-covered pralines won’t have all the toxins most candy has. 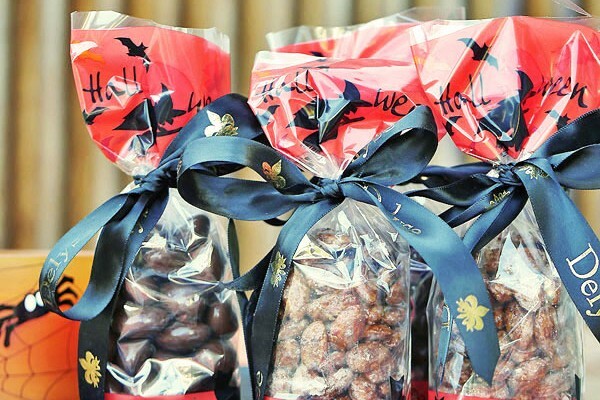 Both our traditional French Almond Pralines and Milk Chocolate-Covered Almond Pralines are available in Halloween sizes and combination treat boxes (also in trick-or-treat size). The larger 4 to 6-ounce Halloween-themed bags are great for party favors, snacking at work or just to have on hand during the Halloween season. The smaller 1 to 1.5-ounce bags are individually wrapped, perfect for handing out as trick-or-treat candy. It’s time to feel great about the treats and candies you eat and give out on Halloween and Delyse is here to help!